It is not often that a good episode on TV fills you with such unadulterated joy that you want to revisit the same to truly believe the magic of what you have just seen or savour each moment of what you watched with sheer anticipation in the first go. It is almost unequivocally believed that barring Jon Snow’s resuscitation and Hodor’s tragic death, Season 6 of Game of Thrones has been insipid by the standards it set for itself in the last five years. Now, you can love GOT or you can hate GOT, but you cannot ignore it. The adaptation of George Martin’s fantasy fiction novels has been way more than just a show – it has become a phenomenon with an unprecedented following across the globe. And the last two episodes of the sixth season prove why the series has reached the level it has. 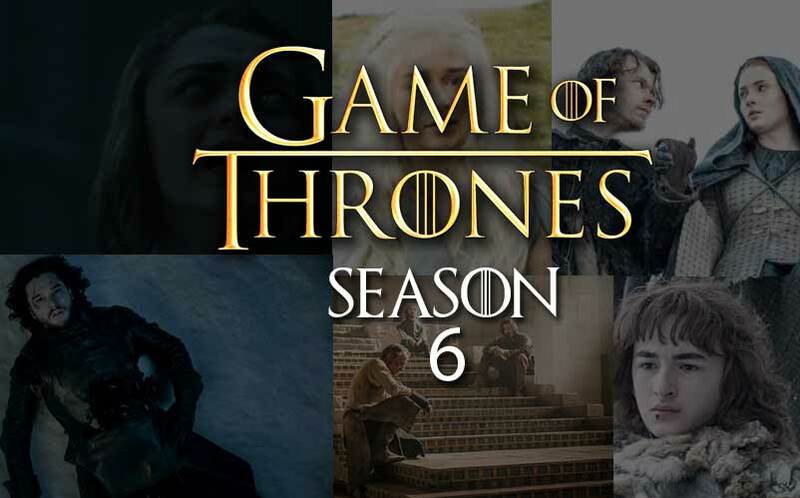 Five years ago, when the story unfolded, we saw the cruel lands of Westeros and its seven kingdoms ruled by apathetic and self-seeking men – butchers, rapists and traitors – dressed in either princely fineries or wild unadorned garbs. The women played the distressed lot – brutalised, widowed or imprisoned. However, since then, the ladies have gradually propelled their ways into the forefront, relegating the once powerful men to the periphery. Currently, it’s pretty much a show about great women and Jon Snow. 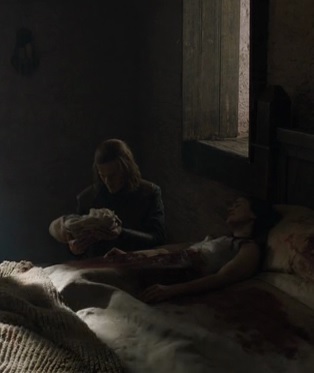 It is also remarkable that despite so many male deaths from Eddard (Ned) Stark to Tywin Lannister, from Joffrey Baratheon to Rob Stark, from Khal Drogo to Oberyn Martell, the only two important female characters that have lost their lives are Catelyn Stark in the infamous “The Red Wedding” segment and Margarey Tyrell in “The Winds of Winter”. And both these women’s demises stemmed from acute callousness of the men they trusted – Catelyn become the compatriot in her son undiplomatic move with Walder Frey while Margarey succumbed due to the High Sparrow’s arrogance despite her being the only person to have guessed Cersei’s sinister plans. The ninth episode of Game of Thrones Season 6 gave us two massive scale battle scenes – one short and slightly wordy and the other long, gory and satisfying. We have now come to expect Daenerys sitting on her largest dragon, Drogon (named after her late husband Khal Drogo), and burning her foes to ashes. Yet, it’s such a guilty pleasure that one cannot help but smile impishly at the spectacle. 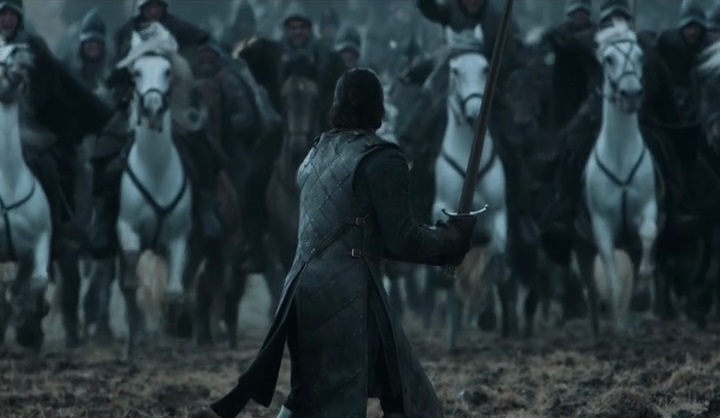 However, the bigger thing in Episode 9 was the Battle of the Bastards (BOB) – the grandest and most macabre war on the show ever. 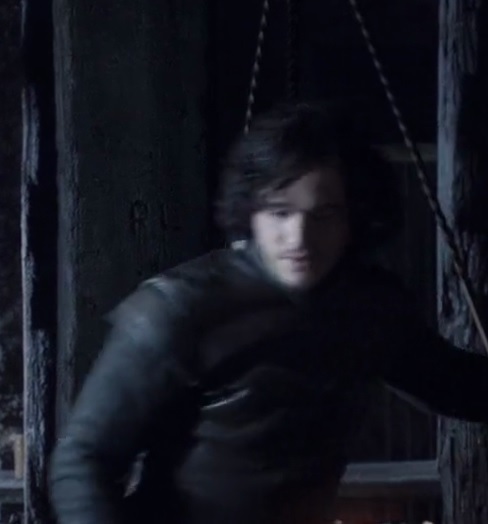 An approximately thirty minute stretch from the beginning of the fight to Ramsay’s death, BOB was one of the most satisfying experiences for the Stark family loyalists, which most viewers presumably are. We have seen the battle with the dead at Hardhome and the one between Night’s Watch and Wildlings at the Wall, but the carnage for Winterfell is the classic medieval cavalry and archery warfare. It leaves with some enduring images of bravery and horror – whether it’s Rickon’s death or the cavalry charging at Jon, the Bolton army surrounding the Stark team or Jon getting trapped amid a pile of corpses. 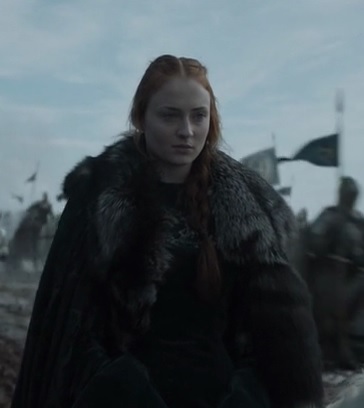 But the most lasting impression in Episode 9 is of Sansa smiling. Twice. First, when the Knights of the Vale arrive and massacre the Boltons. Second, when the hounds shred Ramsay into pieces. The truth remains, even by Jon’s admission, that the war was won more by Sansa’s political finesse than by Jon’s bravery. And here is this girl who started off as a starry eyed damsel dreaming of nothing but a perfectly married royal life, but has metamorphosed into an avenger who lets starving dogs eat her husband. She was the teenager traumatised when the Mountain killed a man in a duel. But she now stops and lingers on the sight of savagery with curious eyes. Season 6 has seen Sansa evolve and how. It now remains to be seen how she takes her alliance with Peter Baelish or Little Finger ahead. If Sansa has been through a psychological turmoil capable of turning anyone insane, her little sister Arya has undergone the most physically gruelling journey for any character on Thrones. Arya has been the cup-bearer for Tywin, suffered an ambush by the brotherhood, tagged along with Sandor Celagne (the Hound) and survived a gruelling training at Bravos. Yet, at no point did it seem that Arya could break. She was there when her father was decapitated, or her brother and mother were mutilated. Yes, she didn’t get to see either of the executions but she wasn’t hesitant to look at death in the eye. She was either held by Yoren or knocked off by the Hound. But revengeful she is just like her sister. The only difference is that while Sansa orchestrates the death, Arya does it herself. So, she can risk entering an enemy land and slit the king’s throat after serving him pies made of his sons’ meats. And she can smile with blood on her face and hands as her enemy slowly dies. Arya is very close to Winterfell and her joining the Starks should happen in the next season. Or will she go off to kill Cersei? If the young Stark sisters are keen on making their foes pay, the women in Dorne (led by Ellaria Sand) and Olenna Tyrell (the shrewdest member of the Tyrell family and Margarey’s grandmother) want nothing else but blood on their hands. Coincidentally, the two women here have the same enemy – the Lannisters. Though Ellaria is not a member of the Martells (Dorne family), she was Oberyn’s lover and mother of his children, and she saw Oberyn brutally murdered by Cersei’s current bodyguard Gregor Celagne, commonly known as the Mountain. It is to note that Ser Gregor is also known for having raped and killed Elia Martell – Oberyn’s elder sister, Daenerys’ sister-in-law, and possibly Jon Snow’s step-mother. However, the two most powerful people women on the show are obviously Daenerys Targaryen and Cersei Lannister – two women so consumed by their own revenge and power that the y can only by destroyed by their own follies. Cersei has already faced that. While the first 20 minutes of the 10th episode play out to an Oscar worthy musical piece, we gradually see the horror that Cersei unleashes on the High Sparrow and the Faith Militant – an attack that also kills most of the Tyrell family. It was almost like watching the USA decimating Osama Bin Laden and the Taliban – the powerful archenemy they created for their own selfish motives. It was evident that Cersei was not going to face trial submissively, and when Tommen squashed her earlier plan of trial by combat, she had to go for something bigger, a plan no viewer could foresee. This was despite the fact that Tyrion distinctly mentioned about the Wildfire that could demolish the Great Sept of Baelor in a conversation with Daenerys just an episode earlier. Yet, in her victory, Cersei lost the last two men she cared for – one who jumped off the window and the other who has started to feel distanced. The only remnant humane side to Cersei’s character was her love for Tommen – her sole living child. However, when the time came to choose between her son and herself, Cersei eventually refused to bother about her son. She killed his wife, subverted his decision and even pretty much put him on house-arrest – leaving Tommen with no option but to die. 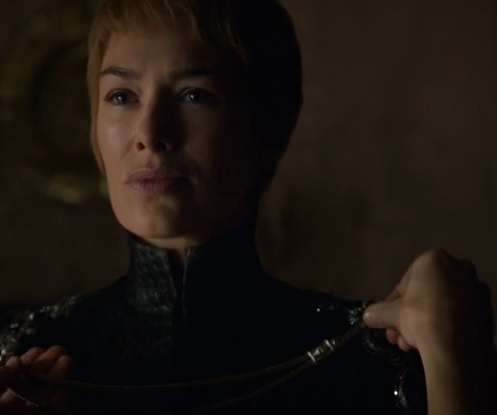 We saw Cersei cry at the deaths of Joffrey and Myrcella but this time, her eyes were not moist. 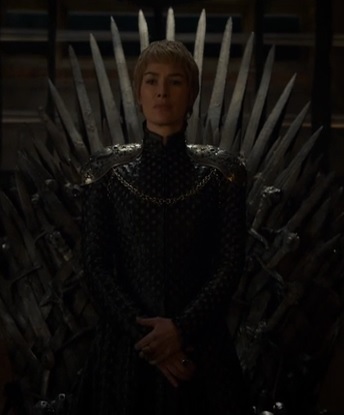 On the contrary, she dressed up like the Queen from the beginning of the episode (compare the pictures), as if she had anticipated Tommen’s action but did nothing to stop it. As if she realised that she deserved to sit on the throne more than her malleable son. Yes, she stopped him from perishing in the wildfire but left him alone to feel the burden of his timidity and defeat. Jaime’s curious look at the end of the episode doesn’t foreshadow a bright future to their relationship either. 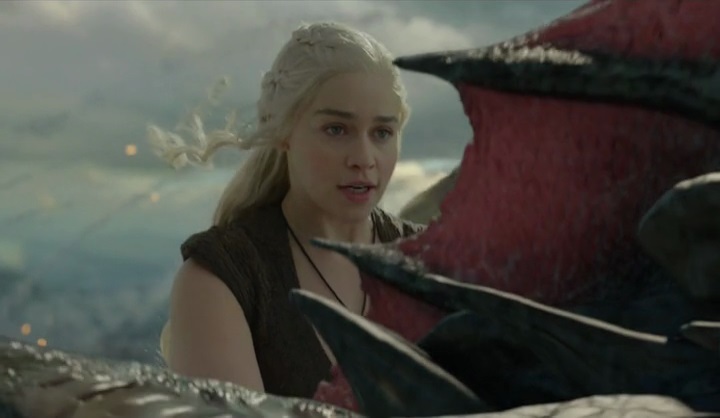 Unlike Cersei who has lost everyone on the way, Daenerys has only amassed more and more support from people – due to her actions, her gift of being unburnt and her dragons. She has the counsel of the two most diplomatic men in the land – Tyrion Lannister, whom she christened ‘Hand of the Queen’, and Lord Varys – the master of spies. She has three mighty dragons, a horde of D othrakis, the slightly useless but brave nonetheless Unsullied, the support from Tyrells and Dorne, and a fleet of ships thanks to the Greyjoys (again masterminded by Lady Yara). She has the best possible resource for anyone planning to wage a war on King’s Landing and the Lannister army. It has taken her five seasons to equip herself for this, and she is finally ready. 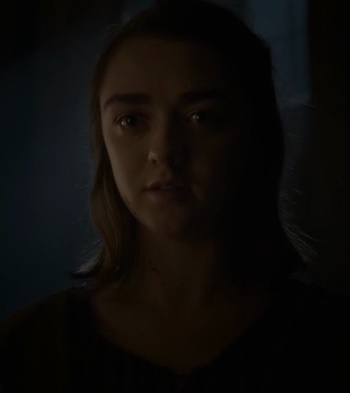 Yes, she has lost three men on the way – Khal Drogo to witchcraft, Ser Jorah Mormont to Greyscale and now Daario Naharis. The first two due to circumstances and the third by choice, obviously Tyrion’s advice as well. She knows that being single is helpful (Bollywood heroine, anyone? ), but then didn’t Daenerys get her foothold in Meereen the same way? Love was never her goal, the Iron Throne was and still is. The Lannisters will have a few surprises up their sleeves, they always do, but then of what help is Tyrion if he cannot predict Cersei’s plans? It would however be difficult for the youngest Lannister sibling with his brother Jaime guarding Cersei – killing Cersei will inevitably lead to removing Jaime from the way. And no one else has ever loved Tyrion as much as his brother has. In the crowd of these fantastic women, let’s not forget the small and unforgettable Lady Mormont, who engineered Jon Snow’s rise to power at Winterfell. Yes, Jon was declared the “King in the North” in a dramatic scene playing to the Stark OST, and I am not happy that he let Melissandre go. It just seems like a bad omen. But let’s ponder over what could be the consequence of Bran’s vision. Now that we know Jon is not Stark but Targaryen, we know that he is the rightful heir to not Winterfell but the Iron Throne. When Ned and Jon parted ways in Season 1, Ned promised to reveal Jon’s mother’s identity upon returning from King’s Landing. However, that never happene d but fans all over got crazy with the R+L=J theory since the fourth episode of the first Season (look at the pic above). If the long-held theory is true, we will discover through Bran that Jon Snow is perhaps the love child of Lyanna Stark (Ned’s sister) and Rhaegar Targaryen (Daenerys’ elder brother) and in effect Daenerys’ nephew. However, the makers of the show smartly withheld the revelation about the father, which leaves the door open for the possibility that Jon could even be the progeny of Aerys Targaryen, popularly known as the Mad King, which would in effect make him Daenery’s brother. Such is the beauty of the show that it gives you not one but three different tracks to look forward to the next season. Well, these are obviously besides the fact that the Starks receive a White Raven, a flock of which Sam sees upon his arrival at the Citadel. Hence, we now know that the season has changed – Winter is here! So, we shall wait a year to see what happens to this exciting story about the Game of Thrones, or as I say ‘Great Women and Jon Snow’. Great Post. As you rightly pointed out its the women who are shaping up the twists and conflicts in the story. You forgot to include Asha Greyjoy (Theon’s sister). Its also interesting to note how the different brother-sister pairs’ dynamics are changing. have you read the books? her name is Asha in the books but Yara in the series.. and I did mention her in the paragraph about Daenerys..
That Battle of Bastards war scene in the 9th episode was literally awe inspiring! It would definitely go down in history as one of the best war films ever shot! Another high moment in the season was the musical piece in the 10th episode that you have mentioned. You are bang on when you say ‘ you can love or hate GoT, but can’t ignore it’. Though i lost interest in quite a few of the tracks story-wise, but it always so bloody well made! The acting and camerawork is always fabulous! This is a great summary of the season and I am so glad and thankful that you wrote this for MAM. Only i felt Ramsay should have been discussed a bit more. He was, for me, the most exciting character this season. He always gave you a strange thrill. And the actor, Iwan Rheon, who performed his role was top class! Him and Lena Headey (Cersei) are my two most favourite actors in the TV series, though almost everyone else are very good too.